Dodgeball worst gym class ever! It's no surprise that I hated gym. I challenge you to name a chubby kid who enjoys lacing up their sneakers and getting sweaty in the middle of the school day. I hated gym teachers -- every single one of them. I hated the way phys-ed class turned my somewhat normal classmates into competitive shark-like idiots. I hated being picked last for teams. I hated every single second of gym and worse yet, I hated Dodgeball. Dodgeball sucked! I can remember the unmistakable scent of that red rubber ball like it was yesterday. I can't forget the bumpy feel of the soft rubber that didn't feel so soft hitting my chubs at 400 miles an hour. Dodgeball was like cruel and unusual punishment. Whose idea was it to create a game where the object is to hit another kid with a ball? Like, huh? I wasn't aggressive. I wasn't violent. I didn't want to slam my fellow classmates with a red ball, nor did I want to get hit. To this day, I have to say dodgeball was the dumbest gym activity ever and NO I didn't bother to see the movie -- I don't want anything to do with supporting the evil game. I was lucky. 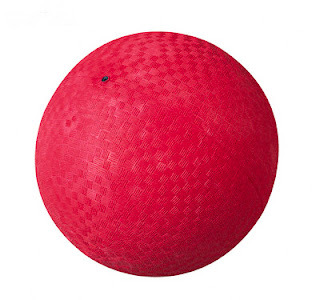 We rarely had dodgeball in elementary school and when we did, it was softer-than-Nerf foam balls. In middle school we had a variant of dodgeball called "Doctor Ball", but it was still super-soft foam balls so the only time it hurt was if you wore glasses and got hit at close range in the glasses. Totally can sympathize with the picked last part, though. I was short, undersized (no muscles for my age), clumsy and wore glasses. We played a lot of kickball; an awful game for someone who had no eye-foot coordination and ran really slow. I understand the need for PE, but why does it always have to be stupid team sports? I think it's great. It was about the only equalizer I had in dealing with the cool kids. I think you're being just a little too P.C. How am I being PC by saying I hated dodgeball, hated being slammed with a ball and hated being picked last? Like I said on your Facebook page: Preach it, sister! Although I wasn't short and chubby, I was the tallest, skinniest kid in my class. So I stuck out like a sore thumb. Perfect for mean kids to hit with a hard rubber ball. I was always out first. And I hated being picked last too. No one wanted me on their team, and it was the worst feeling ever. I miss the '80s, when being quirky, odd, and nerdy was cool, at least in some circles (see the various '80s Nerds movies, or the teen movies like Weird Science), and excessive jockishness was criticized (see the movie Heathers, for example). PC???? I think its a lot more PC to be overly sensitive about someone's dislike of something. I miss the days when you could say what you felt without having to parse every word to make sure noone got "offended." Although, I am glad you were able to get your revenge on the cool kids. More power to you! It is a bizarre game. I used to stay in for a long time... b/c I could dodge and I didn't try to make any catches. But, after a while, I learned to look around me. If there were only one or two kids left on my team, I need to GET HIT. B/c there was nothing worse than being the last kid standing. Oh my god! I totally agree! Especially since my gym teacher used to WHIP the balls at you to get you to participate! I totally agree with you, especially about the part where normal kids turned agressive and mean! Luckily, we didn't play it often. And if we did, I just got hit early in the game so I could go sit down and talk with my friends. I always liked this game when the inside of the pit was filled with kids. But the second it got down to like 10 peopl, I turned into a petrified spaz. I hated dodgeball too. During my teaching training, we had to take a class on physical education and the professor was AWESOME! He said all P.E. activities should have everyone participating the whole time, no one should ever be "out". We played this alternative game to dodgeball where we used a ton of different sized balls. The object of the game was to get all the balls over to the other side leaving your side free. It was great b/c you could throw, kick, roll the balls over to the other side. The competitive kids went crazy running around trying to throw back the balls to the other side as fast as they could, while the less competitive kids could usually find a ball to throw back and feel like they're helping their team as balls went flying back and forth between the two teams. No one had any balls thrown at them and it was a pretty fast-paced game and everyone on the team was valuable. do they still play it now? I am now officially obsessed with your blog! From one fourth grade nothing to another...LOVE IT!